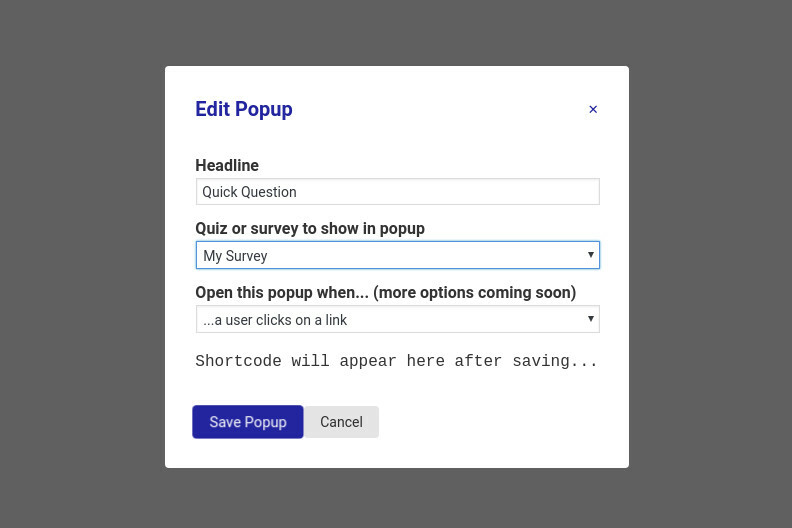 The Simple Popups Addon allows you to create popups that contain your quiz or survey. Once you have purchased the addon, you will have access to download the addon. To install, upload the addon as a normal WordPress plugin. To do so, go to the Plugins page and click Add New. Then, click Upload. From there, upload the zip file that you downloaded when downloading the addon. 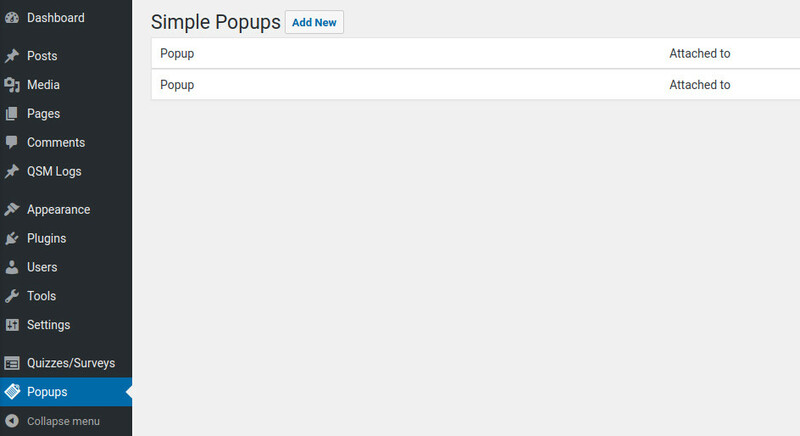 Once the addon has uploaded, you should now have the plugin QSM - Simple Popups listed in your list of plugins. Activate that plugin. Once activated, the addon will add a new tab in the Addon Settings labeled "Simple Popups". First, enter your license key from your account into the "Addon License Key" field on the "Simple Popups" tab of the "Addon Settings". Be sure to click "Save Changes". 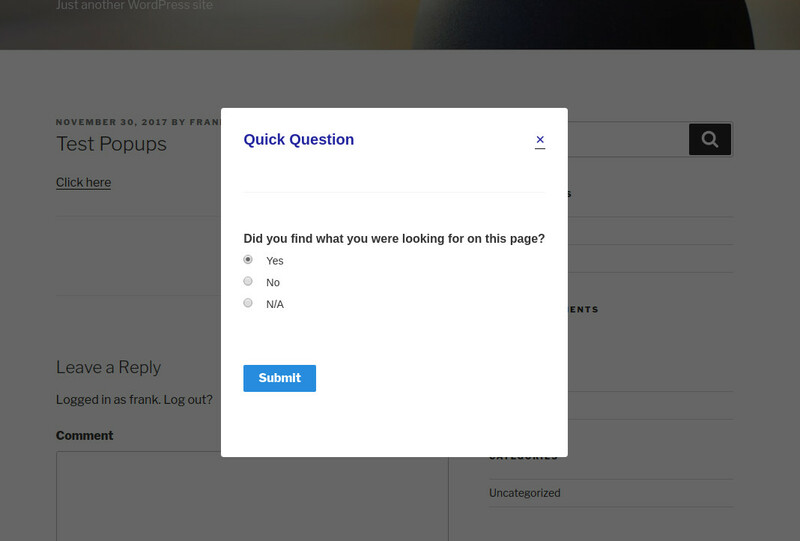 To get started, look for the "Popups" page in your WordPress admin menu. Click on that link to get to the "Simple Popups" page shown in the image below. Click the "Add New" button at the top of this page to create your first popup. 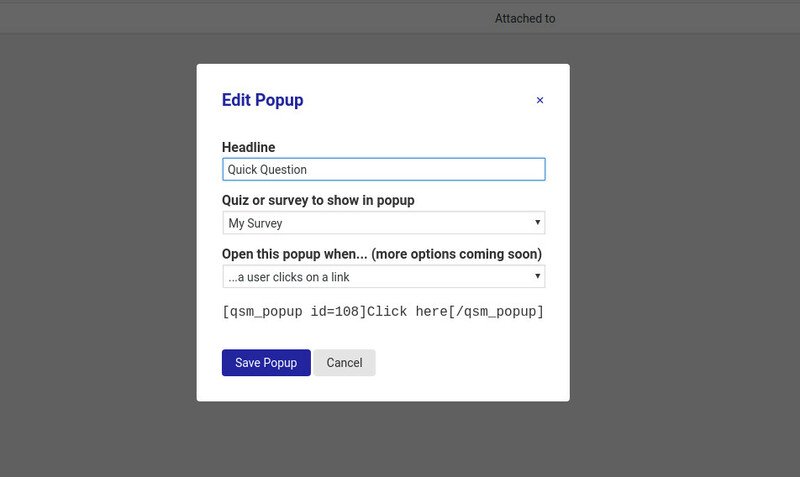 This will open a new popup where we can customize our popup like in the image below. The "Headline" is shown at the top of the popup. Fill this in with any text you want the user to see. 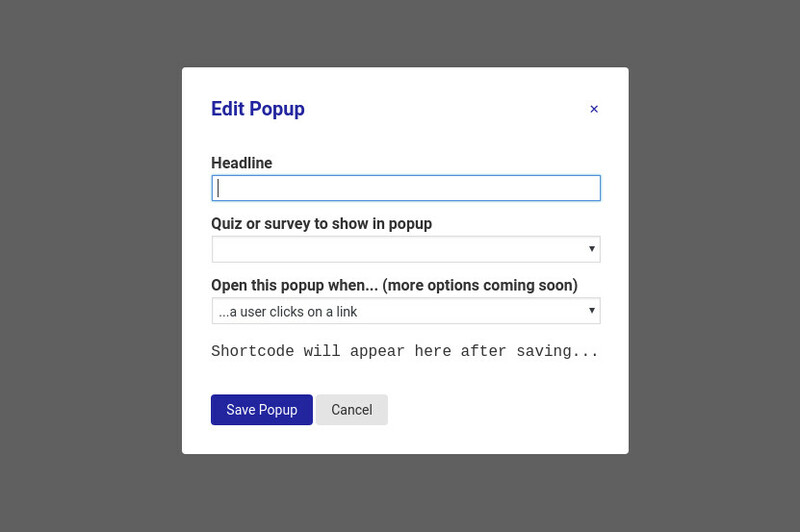 With your popup configured, click the "Save Popup" button to create your new popup. Once created, you can click on the popup's name in the table to edit the popup again. To delete the popup, you can click the trash can icon on the far right of the table. Let's click the popup's name so we can see the popup's options and the shortcode to use the popup. We can now copy the shortcode shown for our popup and paste it into an editor like shown in the image below. You can change the text "Click here" that is inside the shortcode to make your link have other text. Once you paste your shortcode into an editor for a post, page, widget, or another element, be sure to save your changes. Now, you can go view your changes. 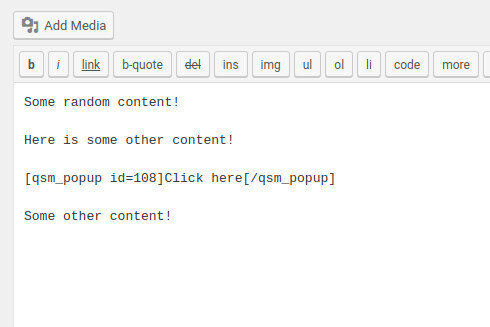 You will see the text between the shortcodes displayed as a link. 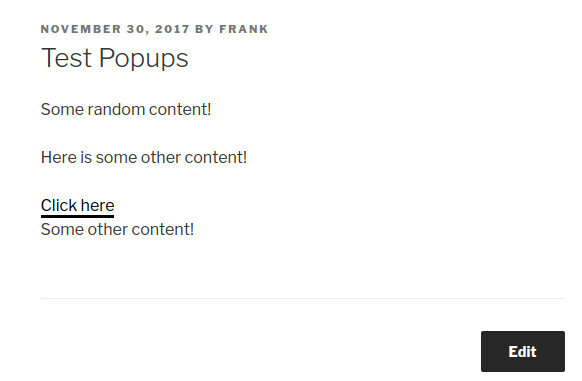 If you click on this link, you will see your new popup. Your popup is now configured and ready to be used!